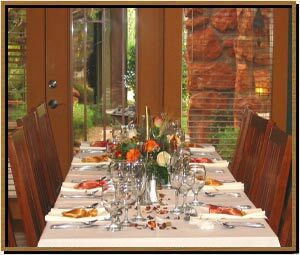 Arizona Weddings and Gatherings at the Lodge At Sedona near Grand Canyon, Flagstaff, and Jerome, AZ. 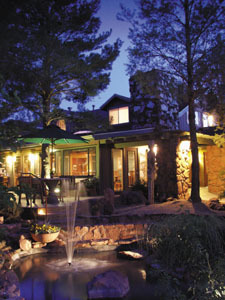 The Lodge at Sedona is a magical location for intimate wedding ceremonies and celebration receptions. The serene estate setting on two landscaped acres provides majestic Red Rock views, bubbling waterfall gardens, lush green lawns, original art sculpture, a romantic labyrinth and towering pinion & juniper trees. A fitting back drop for your very special occasion! 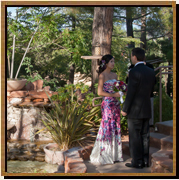 Your ceremony and reception can be held at the Lodge at Sedona for up to 28 guests. We offer well appointed accommodation for 28 guests in 14 guest suites/rooms. A deposit of 50% of total accommodation charges is required to confirm your reservation and secure your wedding date. Gratuity charges will be billed seperately. The exclusive use of the Lodge at Sedona property & facilities for receptions is available with the rental of all 14 guest suites & rooms. The outdoor "Celebration Terrace" is a very special setting for your ceremony and/or reception. The Terrace, with its spectacular Red Rock and natural wooded views requires little additional decoration. Being an outdoor location, usage is seasonal (March - November) canopy tenting/heaters are recommended during all seasons. The Celebration Terrace is ideal for accommodating up to 28 dining guests, formal beverage service and a small entertainment / dance area. Indoor receptions can be held in the Celebration Porch for up to 28 dining guests. Many couples choose to hold their ceremony on the front lawn area or at the magical Lodge Labyrinth in the southern portion of the estate property. Facility charges for weddings and other functions range from $750-$4500+tax (non-refundable) depending on requirements. For smaller gatherings of up to 5 people, who are guests or non-guests of the Lodge, wedding ceremonies can be arranged in or near the Lodge Labyrinth, on the southern portion of the spacious two acre estate property. For ministry referrals visit www.Intimatesedonaweddings.com. On site Executive Chefs provide professional catering for exclusive receptions & parties up to 28 guests. They are delighted to design menus fitting your budget and occasion style - from a casual barbecue to a multi - course wholesome sit down dinner. 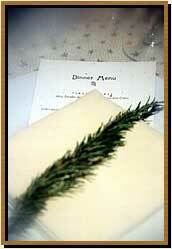 Approved caterers can also provide your catering and beverage requirements on site at The Lodge at Sedona. Dinners typically range from $50 to $85/ guest, excluding beverages. 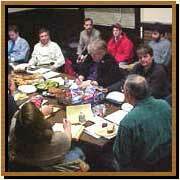 Catering charges include basic glassware, silverware and china. Catering is subject to an 18% gratuity + applicable taxes. Acoustic (non amplified) music or light jazz are welcome on the outdoor Terrace or lawn until 9pm. No music of any kind is permitted outdoors or indoors after 9pm. While your wedding or special occasion is our first priority, your guests staying at the Lodge at Sedona may wish to enjoy all that beautiful Sedona has to offer. Lodge Innkeepers would be pleased to arrange special activities for your group, including in-room massage / body work, off-road Jeep or Hummer tours, championship golf tee off times, helicopter or bi-plane tours, hot air balloon rides, guided trail & vortex tours, horseback rides, cowboy cookouts, plus the many other outdoor activities available in spectacular Sedona Red Rock country. 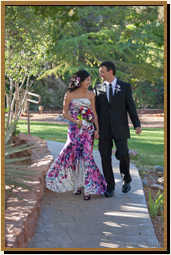 Lodge at Sedona "KEEP IT SIMPLE WEDDING PACKAGE"
This special package is designed to keep your wedding planning simple while we take care of every thoughtful detail. 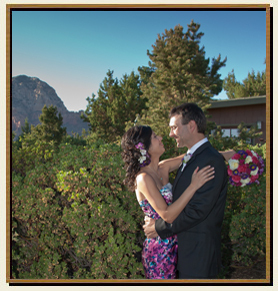 Create special memories on our beautiful two-acre estate or at a breathtaking red rock setting. available between 2:30 p.m. and 7:30 p.m.
…..exactly how you’ve always imagined! between 2:30 p.m. and 7:30 p.m.